These words spoken by the apostle Peter two thousand years ago in the city of Caesarea provided a fitting place to begin our pilgrimage to Israel. Caesarea was an insignificant coastal Mediterranean town until 22 B.C.E., when Herod the Great developed it into a magnificent harbor that held 300 ships. Herod built a stunning palace along the Mediterranean with an almost Olympic size fresh water swimming pool jutting out into the harbor. He also constructed a theater with stone seats that could hold 3,500 people. As we sat on the same two-thousand-year-old stone steps, we remembered that it was in Caesarea where Peter had an experience that forever changed the early Christian church and still transforms us today. The primary issue that faced the first Christians, who were Jews, was what role Gentile (non-Jewish) converts could play in the church. In particular, did Gentiles who accepted the word of God have to become Jews first and keep the whole Jewish law before being welcomed into the church? Acts 10 clearly applies to our world today, especially as many of us struggle with President Trump’s crude and unfortunate remarks last week about immigrants from Haiti and African countries. Dismissing entire countries and continents that are predominantly black or brown is painful to hear, yet arbitrarily deciding who’s in and who’s out and who should be included or excluded is not new. When Cornelius asked Peter to speak what God had directed him to say, Peter admitted that he was trying to learn not to show partiality to some and not others and that in every nation, whoever worships God and does what is right is acceptable. It was an incredible insight for a stubborn and hard-headed man. 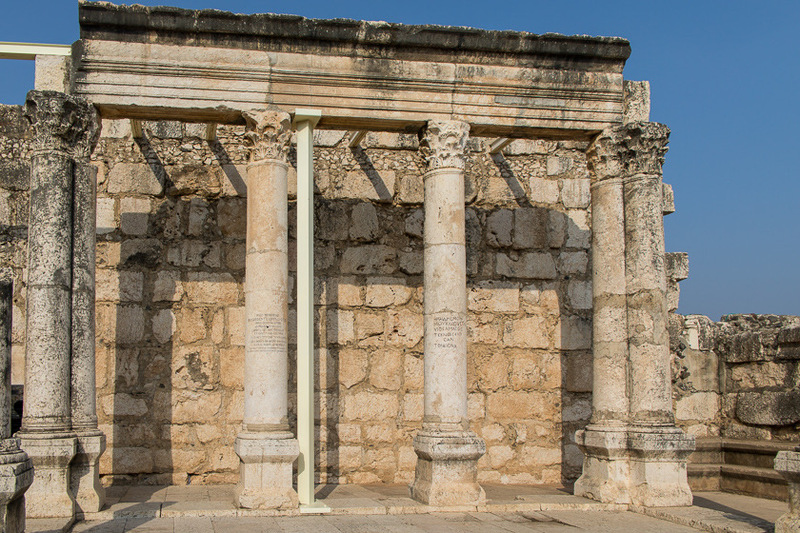 Yet it was this very experience that laid the groundwork for the Jerusalem Council (Acts 15), where the early Christians chose to find a way to be united around how to treat Gentile converts to Christianity. If it were not for Peter’s courage in standing up to his peers, if he had not stated that the Gentiles had received the Holy Spirit just as the Jews did, and if he had not insisted that there is no distinction between “them” and “us”, there would likely not be a Christian church today. In the end, the early Christian leaders decided that the Gentiles only had to abstain from food sacrificed to idols, from sexual immorality, and from “whatever has been strangled and from blood” in order to be a part of the church of Jesus Christ. Three days after remembering the leadership of Peter in Caesarea, where he became convicted that God shows no partiality, our group of one hundred pilgrims from Iowa was sitting on stone steps again, this time at a baptismal site along the Jordan River. We had come to reaffirm our baptismal vows in the same Jordan River where, when Jesus was baptized by John the Baptist, he heard a voice from heaven, saying, “This is my Son, the beloved, with whom I am well pleased. 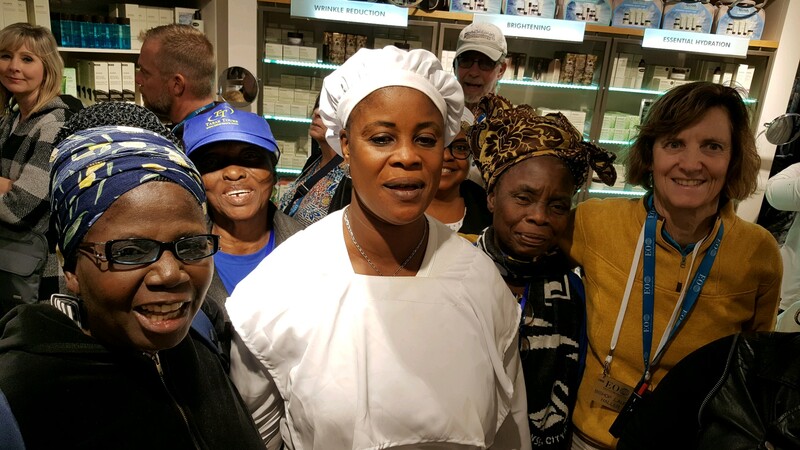 One woman in our group had been active in the church for years but had never been baptized. It was a moving experience for all of us to be witnesses as she proclaimed her baptismal vows. 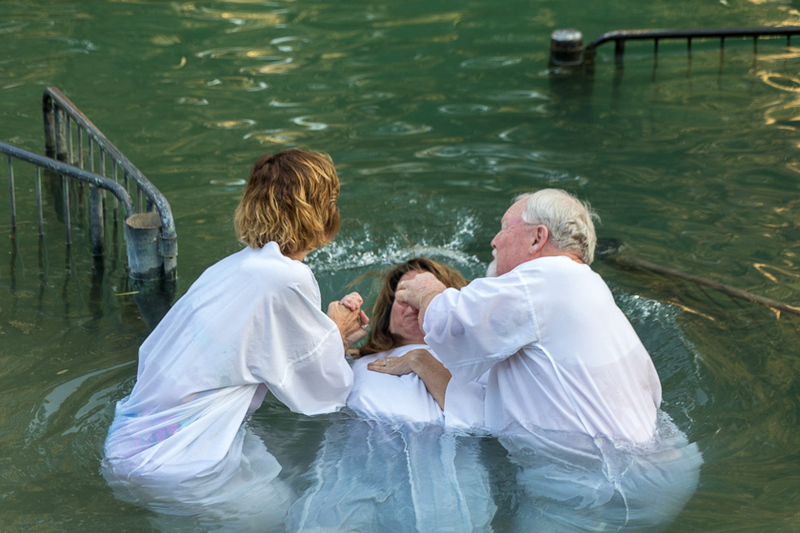 Then, as the rest of us reaffirmed our baptism, with clergy administering the sign of the cross and saying the words, “Remember your baptism and be thankful,” some stayed on the sidewalk, others stepped into the chilly waters of the Jordan, and still others were fully immersed. I admit that I was shivering but not just from the cold water. I was shivering because the Holy Spirit was moving in a mighty way. I was trembling because when the Lord gets ahold of you, watch out! Before the baptism, I read from Matthew 3, “And when Jesus had been baptized, just as he came up from the water, suddenly the heavens were opened to him and he saw the Spirit of God descending like a dove and alighting on him.” At that very moment, a dozen doves flew right over the water directly in front of us. No kidding. What was to prevent these women from being baptized? Nothing. I had never seen or met these women before, yet I could not deny them baptism in the name of Jesus Christ. I cannot put into words the power of that moment and the joy on the faces of those women. I will never see them again, yet when I signed their baptismal/renewal certificates, I knew that their names would be etched in my heart forever. Like Peter, I really am learning that God doesn’t show partiality to one group of people over another. Each day I learn. Rather, in every nation, including Haiti, the countries of Africa, and Israel, God’s love extends to every person, no matter what. By the way, as Peter was witnessing to Cornelius and his Gentile friends, the Holy Spirit came upon them. Peter said, “These people have received the Holy Spirit just as we have. Surely no one can stop them from being baptized with water, can they?” He directed that they be baptized in the name of Jesus Christ, and they were. Thanks be to God. Wish I had known about the trip to the Holy Land. I would have loved to have gone on the trip. Even when I have had grooms get baptized just cause it was expected – I have warned them that something always happens with baptism. Sure enough they begin baptism as an empty gesture. They come from the washing changed. God has never failed to be present. a wonderful experience of baptizing strangers – thanks for sharing. Hope you all bring home water to share, esp. from the Jordan River! Many thanks Laurie, for the never ceasing, amazing trip to the Holy Land. And…the Baptism of the ‘sojourners’ had to be a ‘lifetime’ experience.’ (Doves,indeed? God does great work.) Looking forward to your visit to Grand Rapids this month. This such a powerful story. Thank you for sharing it as a reminder we only need to look around us and be ready to be amazed by the presence of Spirit in our every day lives. Cheri, I am glad to see your post. You probably don’t know me. I m Steve Weeks’ sister. I, too, am amazed and thankful for the presence of the Holy Spirit if we just ask for its presence to be renewed in our awareness. You and Mike are in my prayers. Thank you for sharing the wonderful spirit filled message for such a time as this. Poignant, Powerful and Timely, your words and deeds lift up my spirit. 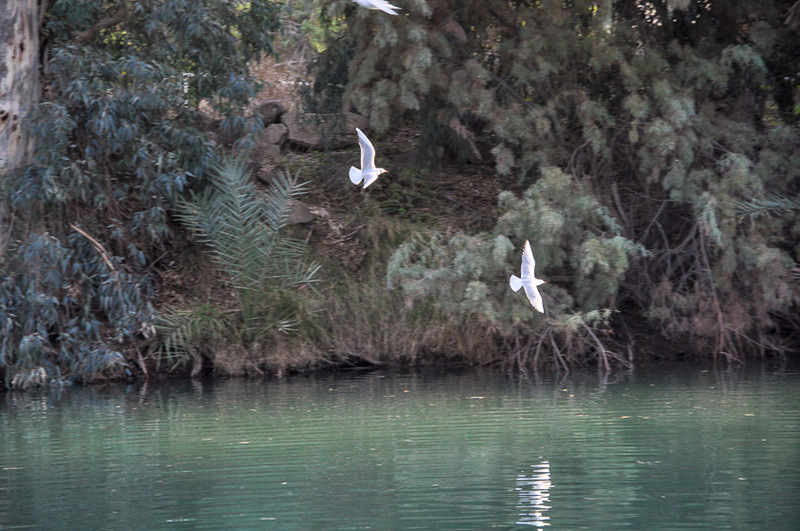 The Jordan River, the blessing, the doves, baptism…my heart was warmed. It truly was a wonderful experience! Bishop Laurie, you have me in tears, once again! Bishop Laurie, this is a wonderful post! Remembering my baptism at the Jordan River with you and Gary is something I will never forget. At the Jordan, we are all one. Thank you again for taking all of us. I am really enjoying your pictures and thoughts as you journey in the Holy Land again. It was so wonderful to share this experience with you. Your words touched my heart. Thank-you, Laurie for this inspiring post. It has warmed my heart and soul. II’d like permission to repost this wonderful blog on United Methodist Insight. Thank you, Cynthia. You may use the blog. God bless you.